Our St Petersburg transfer services are your best choice to get into the city and/or getting around. Once you've landed at Pulkovo Airport or arrived at one of the main St Petersburg train stations, you'll need to decide how to get into the city. There are a number of city transfer options you can take, such as the public transport system, the official Pulkovo taxi, or a private chauffeured car. The private chauffeured car it's our top recommendation as this way the driver meets you at your gate takes care of the luggage and drives you directly to your accommodation fast and hassle-free. On the contrary, if you take the public transport system you'll be struggling with your luggage on a congested bus or metro; while if you take the official Pulkovo taxi, you’ll need to find a taxi on arrival, and wait until someone is available to pick you up. Interested? If you're, then find out below why you should book your private transfer with us. Simply because it is inexpensive, convenient and reliable! Whether you're traveling for business or pleasure, we can offer you a reliable and efficient private door-to-door private transfer service to and from Pulkovo Airport or any other destination in the city at a reasonable price. 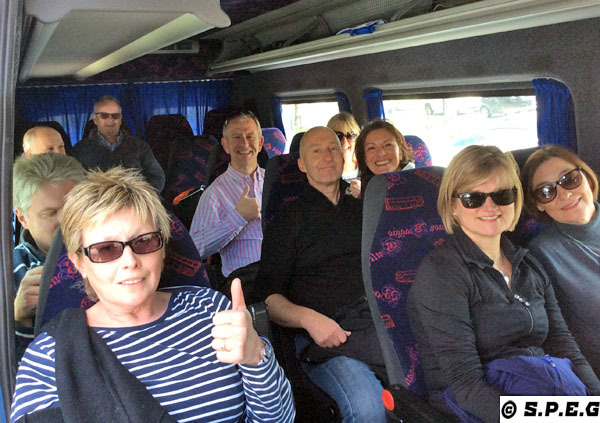 A group of British travelling with us from the airport to the city. ...you will pay a flat rate and know in advance how much you have to pay the driver once you reach your final destination. No hidden fees, no price change! You won't be charged extra for your luggage (one person - one suitcase and one piece of hand luggage). You will get a 5% discount when you book a return transfer. A friendly and professional driver will greet you at your desired location with a card name and assist you with your luggage, and anything else you may need during your trip. After submitting your request to us you will receive an email with all the details of your reservation. No upfront deposit required, and all the information are given in one email. You will travel with an experienced driver that will take you promptly to your accommodation or any place you like. No waiting for a taxi or public transport. You will be able to change or withdraw money after landing. Just add this request during your booking and we'll inform our driver. For any issues, inquiries or additional support you can always communicate with us by phone or email before and/or after your arrival. We speak fluent English, Italian, Russian, including some French and Portuguese. For your information, St Petersburg is divided into four main areas: Admiralty Side (city center), Vasilievsky Island (Island), Petrograd Side (Island), and Vyborg Side (Northern part of the city), so the cost of your private airport transfer is determined by the zone you are going to. The price may differ only if you need to go outside of the city, or if you ask for different routes or additional services. Below you can find details of our most popular routes and the cost for each available class of vehicle. Standard Car suitable for 3 passengers with max 3 luggage of medium or small size. Small Minivan suitable for 5 passengers with max 5 luggage of medium or small size. Large Minivan for 7 people with 7 luggage of medium or small size. Minibus for 17 people with 17 luggage of medium or large size. * Please note that river port and sea port are two different places. With sea port we refers to Marine Facade Port Terminal; while with river port we refers to St Petersburg Port Passenger Terminal. Up to 5 passengers with medium or small luggage in one minivan or just with a few large luggage. For your information, the small minivan fit better 4 passengers with 4 large luggage. Up to 7 passengers with medium or small luggage in one minivan or just with a few large luggage. For your information, the large minivan fit better 6 passengers with 6 large luggage. Up to 17 passengers with medium, small or large luggage you can take a minibus. However, in the event you are a group of 20, 30, or 40 people we'll arrange a modern large bus that host up to 35/45 people. Option Standard Car: If you are a group of 4 passengers with large luggage, for your comfort and convenience we recommend that you order a small minivan. In the event you're a group of 5, 6 or 7 people with many luggage, then better booking a large minivan. Option Small Minivan: If you are a group of 5 or 6 passengers with all large luggage, for your comfort and convenience we recommend that you book a large minivan for 7 people. Option Large Minivan: If you are up to 7 passengers with medium or small luggage in one minivan or just with a few large luggage the large minivan is fine. For your information this vehicle fit better 6 passengers with 6 large luggage. Option Minibus: If you are a large group of 7 or more passengers (7-17 people) with luggage, for your comfort and convenience we recommend that you book a Minibus. Option Large Bus: If you are a very large group of people (17-45 passengers) with luggage, then we suggest that you book a large bus, so that everyone can travel in comfort and safely. All the prices are fixed by the driver, so no discounts can be given. A discount of 5% is available when you book a return transfer from the hotel to the airport, except when you take a minibus or large. Unfortunately, we no longer are able to arrange a sea port private transfer due to a new law in place. However, we are able to pick you up at the port terminal Marine Facade and/or take you back, only if you book a private tour with us. In that case we would like to inform you that there are additional costs to take into account, such as entrance port fees and parking fees. Any extra services or requests, such as an English speaker driver or a first class car is available, but come with an additional charge. Just ask! The prices do not included any extras, such as a child seat or a pet seat, which are 200 rubles extra each. Please note that if you fail to show up at the meeting point without having advised us in sufficient time, you will be charged the full amount due. This is because once you have confirmed your transfer booking we have hired a driver who naturally requires payment. For your information, the cost of the parking at the Pulkovo Airport is covered only for one hour. Therefore, in the event you take longer than 1 hour, then an extra 500Rub are required, and so for each additional hour adding also a waiting time of the driver (800 Rubles per hour). Please note that we don't take last minutes bookings because finding a driver available at the last minute is hard. Please get in touch with us as soon as possible in case of any delay, issues or cancellation. Fill out the yellow booking form below in all its parts, and press the "Book Now" button at the bottom to send your request to us. Soon after clicking on "Book Now" you'll be directed to our "Thank You Page" and receive an automated email. You'll get shortly a new confirmation e-mail with the details of your transfer booking. Ready carefully the new confirmation email we sent you, and reply as soon as you can to secure your booking. If you don't reply, we won't go ahead with the arrangements! After reaching your final destination, you pay the amount due directly to the driver in cash and in Rubles only. Please make sure you book your transfer at least 48 hours before your arrival or departure, so we are sure to facilitate your request in the best of our ability. Ready to book? If so, fill out the form below and click on "Book Now" to proceed with your reservation. Wondering what people says about our St Petersburg Transfer Services? Of course you do! Take a look at the comments below to see what other people are saying about us. Any questions? If you still have some questions about our St Petersburg transfer services please take a look at our most frequently asked questions below. I CAN'T BOOK FROM MY IPHONE OR TABLET - WHAT TO DO? Any other details we nee to know. HOW CAN I CANCEL OR AMEND MY TRANSFER ORDER? You can cancel or amend your transfer order up to 24 hours before the agreed time of your transfer. If you book your transfer less than 24 hours before your arrival/departure time, we don't guarantee that we will be able to reply promptly and so arrange your transfer. HOW CAN I PAY THE DRIVER? You can pay the driver in cash in Rubles, the Russian currency. Unfortunately, no credit cards or international currencies are accepted at the moment. Please make sure you pay the driver with small notes to avoid change's issues. I DON'T HAVE RUBLES! WHERE CAN I CHANGE MONEY? We suggest that you change money in your country before you leave or upon your arrival at the office exchange in the arrival halls. You can also withdraw money safely from any ATM machines you find at the airport/train stations, or much better, go to a local bank. If you intend to change the money at the St Petersburg airport, please tell us about it during your booking in order to inform the driver and we will assist you with that. Of course you can! Once you have reached your final destination and paid the driver, you can ask for a receipt. Please inform us about it in advance, if you want one. Also, we can send you a receipt via Email after your trip. Our drivers speak only Russian and have only basic knowlege of English. But don't be afraid of that because all our drivers are in contact with us for the whole time of your trip. Thus, if any problem arises they will call us and put you through us. Our drivers use Google dictionaries as well. There is no need to tip the driver! Tips to the driver are up to you. But in the event you are so kind to give a tip to the driver giving a 5-10% of the taxi fare would be fine. We offer different type of cars, all well maintained, comfortable, clean, air-conditioned and not older than 7 years. The car model vary according to what driver comes to pick up you. Usually, you can expect to travel with a Hyundai, Mercedes, Ford or Fiat. DO YOU PROVIDE WITH AN INVOICE? Yes we do! Just ask. DO YOU OFFER A BUSINESS CAR SERVICE OR LIMOUSINE? Yes we do! Please get in touch with us for more details.